They still haven't played much of anybody, and the B12 is still the weakest of the P5 conferences. Very interesting numbers once again. As always the formula shows the problem with the RPI and its use. We start with a system that is highly simplistic and as a result creates many absurd results. Then those results are filtered again by using the initial rankings and applying them to determine a new set of rankings. Presumably this improves the process, but in so doing it creates more unintended consequences. Your formula does a good job of predicting what the Committee will do so I believe it has great value; the question is whether is whether it appropriately evaluates the teams. To illustrate I use two Pac 12 games played on Sunday. 1) USC - Cal Cal beat USC which moved USC out of the top 50 and kept Cal in the top 25 (My calculations are rough, but I believe Cal would have been 26 (instead of 17) and USC would have been 42(54). Therefore if USC had won the impact on Cal and USC would have been zero (Cal has two wins over a sub 50 team now worth 0, if they had lost they would have 1 win and 1 loss over a 21-50 team worth net 0. USC has 2 losses against a top 25 team worth 0, had they lost they would be 1-1 vs a 26-50 team worth 0). By Cal winning every team that Cal played benefits while every team that USC played gets hurt. USC gets ranked ahead of both Stanford and Cal despite going 0-4 against the 2 schools, in part because USC losing to Cal cost Stanford 2 points. 2) Oregon - Oregon St Oregon avenged its Friday night overtime loss by beating the Beavers. Oregon's win didn't help them. They were already -2 for their first loss to the Beavers; had they lost a second time OSU would have jumped into the top 50 and each loss would only count as minus 1. The Beavers picked up 2 points for beating the Ducks Friday and could have picked up another two had they beaten them on Sunday. OSU and USC are both outside of the top 50 in the RPI, but both in the top 25 according to the formula. OSU is the most miscast team in the country. In the three tiered system (1-25, 26-50, 51+) they are considered as a bottom tier team according to the RPI. But according to the formula they are 18th and they are top 20 in the computer rankings (Massey and Sagarin) and the polls. That difference affects every team they play. Among the top 25 RPI teams, I believe that Rutgers, Buffalo and Villanova at a minimum do not deserve that rating, while Michigan, Oklahoma St and Oregon St do. This is, with the exception of Rutgers, in conformity with the formula. Among the top 50, Northern Colorado, Houston and Toledo are the most undeserving. Some of these ratings problems will be lessened as the season moves on. Washington St had been a top 50 team for a long time but finally fell out by virtue of playing Washington twice. Houston will almost certainly fall out of the top 50 unless they go undefeated the rest of the way. But for Rutgers, Buffalo and Villanova they will be overrated; it is just a matter of whether it will put them in the wrong tier. And for me, hopefully the Committee will look more closely at the difference between beating a #48 team and a #52 team, or a #30 team and a #45 team, and even a #56 team and a #86 team. Your formula does a good job of predicting what the Committee will do so I believe it has great value; the question is whether is whether it appropriately evaluates the teams. I'm sure it doesn't. I use RPI because the committee uses RPI, but even if we used a different system the same problems would persist. With 349 teams, most of whom don't play each other, there will always be teams that look better/worse than they really are no matter what kind of system you use. Sagarin, who has done the best in my tournament bracket competition of late, has Green Bay and South Florida in the top 20. 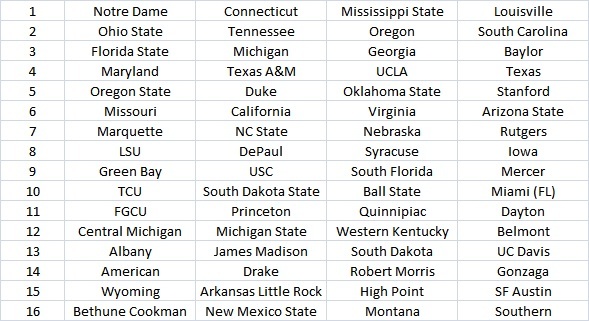 Does any real person think they are among the 20 beat teams in the country? I would rate both of them behind LSU, who he has at #50. HerHoopStats has been much lauded of late, including getting their ratings mentioned on ESPN. They have Virginia Tech and Utah in the top 30. Neither is even a legit bubble team at this point. The ratings all have flaws. You just have to decide what you're willing to live with. Many teams were moved within the same seed to prevent teams in the same conference from meeting before the conference finals or to meet the new rules about conferences with top four seeds. In this instance four teams swapped seeds to avoid this. USC and Dayton moved up one; Miami (FL) and Michigan State moved down one. The cut off for getting in as an at large was -1.25 points. It took 14.5 points to get a #1 seed. Hey, pilight, your bracket image link is broken. Comparing your projection to Charlie Creme's latest, there are 4 teams on which you differ. You include USC (9), Ball St (10), TCU (10) and Michigan St (12) whereas Crème has West Virginia (6). Villanova (8). Purdue (10) and Creighton (10). If it were up to me I'd take West Virginia, Villanova, USC and TCU. Many teams were moved within the same seed to prevent teams in the same conference from meeting before the conference finals or to meet the new rules about conferences with top four seeds. In this instance two teams swapped seeds to avoid this. FGCU moved up one; Syracuse moved down one. The cut off for getting in as an at large was -2.75 points. It took 14.75 points to get a #1 seed. Did you not see that you have Miss St & TAMU and S Car & Georgia in the same region? 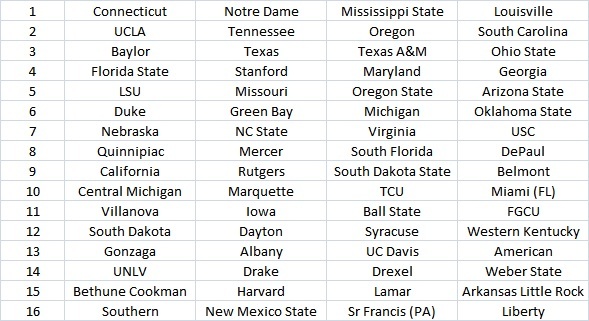 Conference teams seeded 1-4 have to be separated unless there are more than 4 of them. That rule is in addition to the one about not meeting until the regional final. There are no SEC top16 teams in the Albany region. I'd say swap Fla St and Geo but then there would be a Geo-LSU game in the second round. I'd swap TAMU and Baylor. Tamu wouldn't face LSU until the regional final and none of the top 16 SEC schools would be in the same region. The NCAA has so many rules now that they have to break at least one of them. Seeing UCLA and Tennessee seeded ahead of Baylor is making me nauseous, but thanks for the Minnesota props. yeah this is no bueno . one of these #1 seeds will have to possibly face baylor . A clear cut top 4 team in the country . Hopefully its not Miss. State again . But don't worry, Baylor will get their #1 or #2 seed and we'll get even fewer good non-conference matchups. Why schedule anyone good when you can get a high seed with a full slate of cupcakes? IMO, if Baylor wins out, at worse they will be the top #2 seed (#5 overall). Last year that was the difference between them being the #3 overall seed and #4 overall seed, which, in retrospect, would've given them a much easier path the the Final Four/Championship game. Both make a huuuge difference . If they meet again in the tourney i dont think the bruins get by . Baylor doesn't have much else to hang their hat on. Creighton has more games against the top 25 and the top 50 than Baylor does. If the committee rewards the Bears despite the Baylorizing of the schedule, it will lead to even more cupcake scheduling. Not going to lie , i was one that thought mulkey was being a soft punk A** with the schedule she put together. Next year i doubt she does that since she has the top recruiting class smh . Running from the competition deserves to comeback and bite her now that i think about it . Exactly. But that means that 3 regions need to have one and only one region two. You have the 5 teams in 3 regions. Missouri is a 5 seed. I'd rather have to play both of them than one game against Baylor. That's not what the rule says. The rule says if there are more than four they don't have to all be separated. They can't ALL be separated but only what is necessary. But then I've learned to not predict what the committee does. If you are correct then they are free to put 4 in one region.